This past week has served up two examples that reminded me of why I watch sports. 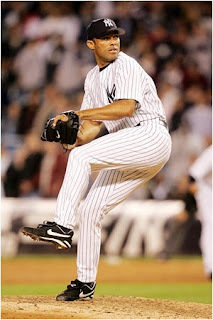 Mariano Rivera, the amazing Yankee reliever, earned career save number 500. (Actually he's up to 537, if you include postseason saves.) He's been doing this for a decade and half now—coming into a game, mowing down hitters, going home. So dominating is he, so regular as clockwork, that if he actually blows a couple of saves, the usual media suspects start to question, "Is Mo slipping?" They've been doing this for years now. And Rivera's answer is simply to put up the same mind-blowing numbers again, year after year. This season, when people were writing him off, saying he was losing it, getting old, all Rivera has done is keep his WHIP below his career average to the tune of .923. And he's raised his SO/BB rate to the highest of his career, a ridiculous 14.00. Actually, Rivera has done two amazing things. Aside from his lengthy dominance on the mound, he has, in a media-saturated town, managed to be the best at what he does for over a decade—at a position that usually burns people up in a few years—and remain out of the spotlight. Almost underrated. There's never been any paparazzi shot of him at a club. No shouting matches with a manager. No commercials. There's hardly a picture of him on Google without one of his Yankee uniforms on. No one has ever rushed the mound at him. Nothing. Just Mariano coming out of the pen, shutting down the other side. End of story. You've all heard the numbers: the first all-time in adjusted ERA...by a galactic 40 points. 17th all-time in ERA; with the sixteen in front of him all from the 19-teens, deadball era. Lowest career ERA in the postseason ever (0.77 ERA in 117.1 innings pitched). 3rd all-time on the SO/BB ratio. Most saves saved in a World Series (9, Rollie Fingers is 2nd with 6.) 3rd lowest WHIP all-time, and the 2 pitchers ahead of him last pitched in 1917 and 1910. While compiling these video game numbers, throughout it all, there's been a sense of class. Of quiet dignity. Rarely anything but a "Just my job" type of walk off the mound and a handshake for his catcher. Nothing gets to him, even when he fails. And yes, he has failed. He gave up a huge home run against Cleveland in 1997, just four outs from the Yankees winning the AL Championship. He blew the 9th inning of game 7 of the 2001 World Series with a throwing error and a bloop single. And though giving up only one run the entire 2004 Championship Series, the Red Sox beat him and went to the World Series. Even still, Rivera retains that quiet confidence, that inner peace. No matter is it’s a meaningless game in April or the World Series, Rivera remains Rivera. Former reliever, Goose Gossage once said that "...even if the hitters beat Rivera, they never get to him. Rivera does not scream or throw his hat or kick over water coolers; he won’t give them the satisfaction." Last year, this very blog called the Wimbledon finals match between Roger Federer and Rafael Nadal the best match I've ever seen. And it wasn't just me; John McEnroe, the Sporting News, ESPN and a legion of other people and web sites all said the same thing. Unfortunately, for Roger Federer, he lost. Despite the fact that he had won Wimbledon 5 times in a row, that he was widely considered to be the greatest tennis player in the world, if not ever, despite the fact that he had set a record for being the number one ranked tennis player for a preposterous 237 weeks, Roger Federer wept. It mattered that much to him. He had won it 5 times in a row, yet still he cried beca use it meant that much to him. In an era where players only play hard in their "contract year" or walk off the field before the game is over, or claim "it's only practice," to see a player not achieve as much as Federer has, but to see that it still matters to him this much, is a pleasure. If players take plays off at defensive end, or jog after a fly ball over their head, why should we care? And like Rivera, there's never been a controversy with him. All the other players in tennis consider him a friend, even his rivals. He makes a point to be gracious to the ballboys and the security guards. When asked if it was true that some players dislike Andy Roddick, even off the record, Federer only said nice things about him. After last year's devastating loss in Wimbledon, Federer lost again to Rafael Nadal in Australia in straight sets. Federer was devastated. Like Rivera, his defeats got to him, truly bothered him. But like Rivera, he regrouped and tried again. And he went out and beat Nadal in Madrid, ending Nadal's 33-game winning streak on clay. Then all he did after that was come back from down 2 sets, to eventually win the French Open and complete a Career Grand Slam. Then he turned around and won Wimbledon—the place of his greatest nightmare—by winning the longest men's singles final (in terms of games played) in Grand Slam history with 77 games played. With that nail in the coffin, Roger Federer is the greatest tennis player to ever play the game. And these guys are the reasons I watch sports. And because of Michael Phelps and Peyton Manning. And because of Greg Maddux, Don Mattingly, Michael Jordan and Bjorn Born. The late great, Vince Lombardi said, It's not whether you get knocked down, it's whether you get back up." Both these men have been hit, and hit hard in their sports career. But they kept going. They kept trying. Rivera was "finished" according to writers as far back as 2004. Since then Rivera has accrued 167 saves (so far). Federer, likewise was called "done" last year when Nadal beat him in the French, British and Australian Opens. All he's done since then is defeat Nadal on his favorite surface, and win three Grand Slams. And they've both done it with grace, civility and sportsmanship. The great John Wooden once said, "Sports do not build character, they reveal it." In the cases of the two men who achieved milestones this week, that is most certainly true. well put, guess there are role models still in sports, you named a bunch of them. I watched some of the early sets in the finals today then watched the 5th set. Federer was cruising through most of his service games in the 5th set late, Roddick was getting through them as well but often was down 0-15 or 15-30 and needed to refocus to hold on. It was evident that Roger would win, I thought the class shown by everybody afterward was nice too. Sampras is one you can add to your list of classy role model types of athlete that never seemed to be on the wrong side of the news. Is Phil Hughes A Reliever?